Charles Barkley was born in Leeds, Alabama, in 1963. A high school and college star, he was drafted by the Philadelphia 76ers in the first round of the 1984 NBA draft. In 1992, Barkley joined the U.S. Olympic team, helping the infamous "Dream Team" earn the gold medal. Barkley was one of the NBA's most remembered players not only for his talent but also for his personality and courtside antics. Born on February 20, 1963, in Leeds, Alabama, Charles Wade Barkley is widely considered one of the forwards ever to play in the NBA. Despite his size—at just 6'4" tall—Barkley was a dominant inside presence throughout his NBA career. He's one of only four players in league history to score at least 20,000 points, collect 10,000 rebounds and hand out 4,000 assists. In 1996, he was named one of the NBA's 50 greatest players. Still, Barkley was not initially on the radar screen of many college scouts. But in his senior year at Leeds High School, Barkley began to turn heads. Having grown six inches in just 12 months, Barkley averaged 19.1 points and 17.9 rebounds per game that year, and led the school to a 26-3 record. In the conference semifinals, against Alabama's top player, Barkley wowed college scouts, by scoring 26 points. That performance led Barkley to Auburn University in the fall of 1981. There, the Round Mound of Rebound, as he came to be called, was a force in the paint. Over the course of his three-year career at the school, Barkley earned several honors, including Southeastern Conference Player of the Year in 1984 and was named All-SEC player three times. He was later named to Auburn's All Century team. Following his junior season, Barkley declared he was ready for the pros. In the spring of 1984, the Philadelphia 76ers selected the power forward with the fifth overall selection in the NBA draft. The 76ers were just a year removed from an NBA title and stocked with a veteran roster that included Julius Erving and Moses Malone. For Barkley there was little transition to the pros. His rookie year, he averaged 14 points and 8.6 rebounds per game and was named to the NBA All Rookie Team. That year, the 76ers advanced to the Eastern Conference semifinals, where the team lost to Larry Bird and the Boston Celtics. The success of that season proved to the most the club achieved during Barkley's sometimes turbulent eight years in Philadelphia. Early on, especially, Barkley was hard to play with and coach, someone who was notoriously criticized by his teammates because of inconsistent play and temper tantrums. But he came into his own during the 1987-1988 season, when he was named to the All-NBA team for the first of four consecutive years. In 1992, Barkley joined the U.S. "Dream Team" at the Olympics. 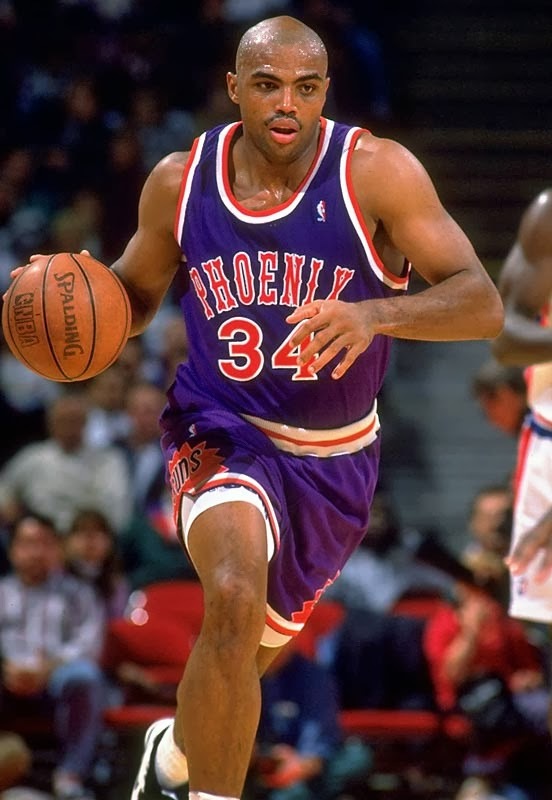 After helping the team win the gold medal, he was sent to the Phoenix Suns where he won the MVP award and led the club to the 1993 NBA finals. In the championship round, the Suns were defeated by Michael Jordan and the Chicago Bulls in six games. Sir Charles has become one of the NBA's most visible players due as much to his talent as to his courtside antics. He was criticized in March 1991 for "spitting" at a child, and later explained that he'd meant to hit a fan who was taunting him with racial epithets. Despite a share of negative publicity, his outgoing personality also earned him numerous commercial endorsements. During a pre-season drill in October 1993, Barkley collapsed when his legs went numb. Though tests revealed a back injury,he announced a few days later that he would retire after the 1993-94 season. However, he decided to play after all, and in 1996, he was traded to the Houston Rockets and named one of the NBA's 50 greatest players in a ceremony marking the league's 50th anniversary. After retiring from the NBA, Barkley signed on to do a talk show on TNT in 2003 called Listen Up!. He currently works for the network as a studio analyst for Inside the NBA. His book, I May Be Wrong but I Doubt It, was published in 2002.